My kids love tacos, but they get so frustrated when they are trying to eat a crunchy tortilla taco and it breaks into pieces after one bite. 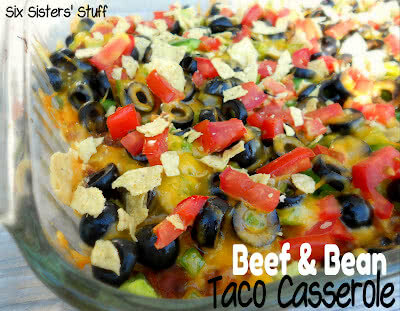 This casserole is basically a crunchy beef and bean taco all spread out in a casserole dish . . . and my kids INHALE it. It’s such a quick and easy meal that you will have to add to your meal rotation! Heat oven to 350 degrees Fahrenheit. In a large skillet, cook beef over medium-high heat 5 to 7 minutes, stirring occasionally, until thoroughly cooked; drain. Stir in refried beans, salsa, and taco seasoning mix. Reduce heat to medium. Heat to boiling, stirring occasionally. In ungreased 2-quart casserole, place 2 cups of the broken tortilla chips. Top evenly with beef mixture. Sprinkle with bell pepper, onions, 1 cup of the tomato, the cheese, and olives. Bake uncovered 20 to 30 minutes or until hot and bubbly and cheese is melted. Top baked casserole with lettuce, remaining 1/2 cup tomato, and remaining 1/2 cup tortilla chips. Sounds delicious! I'll have to make that! For the love of God woman! My mouth is now watering!!! This reminds me of 7-layer dip (which I'm obsessed with). Yum! I made this for dinner last night and it as a HIT! Soooo yummy, thanks for sharing! We really enjoy this meal but serve the chips on the side. They tend to get soggy pretty fast and no one will eat the left-overs if it has soggy chips in it. Made this last night and it was super yummy. Added some sauteed mushrooms in the beef mix and then some sour cream when it was on our plates. Yum! I made this for dinner tonight. YUM! The only thing I changed was to add fresh garlic then saute garlic, bell pepper and onion with the meat. Did fresh guacamole as a topping. Great recipe! I made it tonight and made half with the chips in and the other half without (serve on the side) that way our leftovers won't have soggy chips! Can't wait to try it! We made this for dinner last night, and it was a hit! Sure to be one of our regulars! The only thing we did differently is added sour cream and salsa to the top! I have made this dish a few times, and we LOVE it! Thanks for sharing. I also posted a link to it on my blog so family and friends can enjoy as well.